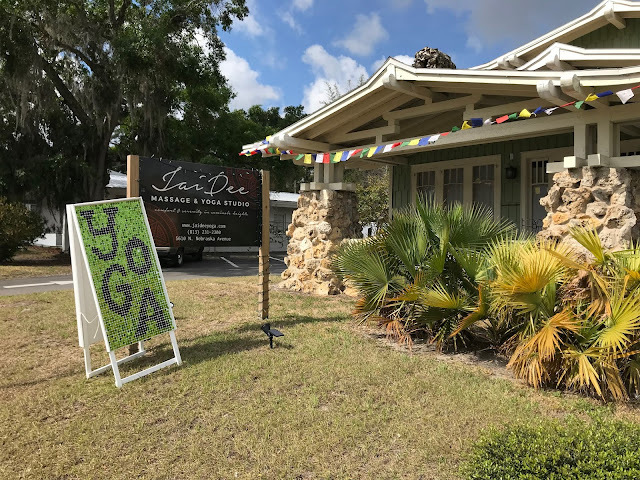 I had an idea to make a sign that I could bring with me when I teach at Jai Dee in Tampa, 801 E. Main Street in Lakeland or any other place that I might get the opportunity to teach at in or around the Tampa Bay area. I've always loved the way sequin signs catch the sunlight and move with the breeze. The parts are available online in 12x12 plastic pre-pinned boards, but they're very expensive. I decided I would use a "handypanel" 2x4ft section of pre-sanded plywood and 1x2x8 strips of wood from the local hardware store and get to work on making my own custom 'pinned' wooden A-frame sign. I ordered the bags of 20mm sequins from Aliexpress, 8 boxes of WIRE BRADS 18X 5/8 and used a big sheet of packing paper to grid out the proper spacing of the nails to keep the sequins from overlapping. I used a center punch to put a small divot in the plywood sheet at each intersection of the grid (where each nail would go) and then used a pair of flat tipped pliers to hold each nail an equal length from the plywood surface and hammered each nail in. This is of course after building the sign and painting the surface white with three coats of outdoor rated paint. The total number of nails used = 3600. To keep the sequins at a distance from the wood backing (so they'd shimmer in the breeze) I used short 1/4 inch sections of cocktail straws cut down to serve this purpose. After nailing in all the nails, each nail had a cocktail straw spacer placed on it and then I could begin to pop the sequins into place over the wire brads nail heads. What I had not initially planned for was a safety border around the edges of the sign to keep the nails from getting impaled into the grass when the sign would take an inevitable face plant on a windy day. I'd made the front facing edge of the sign a bit larger (1/8 in) than the underlying frame which made coming up with an edge framing solution a little tricky. Eventually I settled on using small strips of wood to bring the underlying frame out to the same edge as the front of the sign. Then I used wood trim painted white to create a top and sides frame for the sign fronts which will keep the nails and sequins from coming into contact with the ground when the sign falls over. I finished the protective edging in time to use the sign outside of Jai Dee last weekend. It was a really windy day and the sign fell over a few times with no damage to the sequins. Several people commented on noticing the sign as they drove into the studio and that they could see the sparking sequins from a great distance. I'm thrilled that it came together nicely even though from beginning to end it took about a month of intermittent work (nails/spacers/sequins) and then another couple of months for me to figure out a protection frame and the time to put the framing on the sign. If you want to make your own sequin sign, it just takes some time, patience and keeping your eye on the finished goal while you do the work that gets you to that goal.